This is a post by Stefan Busch, Publisher at BioMed Central, and Gerald Langhanke, Trainee Librarian at ULB Darmstadt – a co-authored poster on the topic is also available. January’s piece about the Impact Factor trend of established journals that had joined BioMed Central’s portfolio of open access publications generated considerable interest. We asked whether there was an open access citation effect to observe, and whether the findings had implications for an editorial strategy? The answer we found was ‘yes’ to both questions. We are now reporting additional data, and gradually the picture is becoming more fine grained. It shows the extent and the sustainability of the Impact Factor gains of such journals after their conversion to open access. This short report outlines how the story continued for the five journals we discussed in January, and now they are joined by one further title, Veterinary Research, which for years has been the highest-ranked journal in veterinary science. To the graphs below we have also added the trend for the median Impact Factor in the relevant subject category, as available from Thomson Reuter’s Web of Science, thereby providing a benchmark or ‘control group’. the journals have published no fewer than 30 articles per year in the two-year periods before and after the transfer. On then to the findings. The four titles for which we reported a significant post-conversion increase of their ranking saw this trend continuing. These four publications are Acta Veterinaria Scandinavica, Journal of Cardiovascular Magnetic Resonance, Journal of Experimental & Clinical Cancer Research, and Genetics Selection Evolution. Generally, the Impact Factors leapt once the calculation was based entirely on articles published by BioMed Central, i.e. after two years. In the case of Acta Veterinaria Scandinavica this effect appeared after only one year, most likely influenced by the fact that very soon after the transfer several volumes of the journal’s back content was made available from both the BioMed Central site and PubMed Central. The graphs show how the journals’ Impact Factor trend crosses or departs from the subject category’s median Impact Factor (source: Web of Science). A ranking above the median means that a journal counts among the top 50% of the titles in the respective field (in which the vast majority of journals follow the subscription model). For two further titles, however, the Impact Factor has developed in a different way, and these differences can be linked to editorial strategies. Last year we already pointed to the interplay of “qualitative growth” (ranking) and “quantitative growth” (article numbers). All of the journals covered in this report published more articles in 2013 than in their respective final pre-conversion year. So all of the titles have been growing in size, but it makes a difference whether this quantitative growth happens steadily, or whether right after the conversion (which often means a liberation from page budgets or similar constraints) the number of accepted papers rises steeply. The latter was the case for Journal of Biomedical Science and Veterinary Research. Veterinary Research stands out here in that its Impact Factor level remains way above the subject category’s median. The journal was and is the highest ranked title in its field. While for the time being, in the absence of more data, this ultimately remains conjecture, it nevertheless stands to reason that the upward potential for the Impact Factor trend is higher for journals which – like the other titles in this group – start their open access career with Impact Factors below or near the median curve. 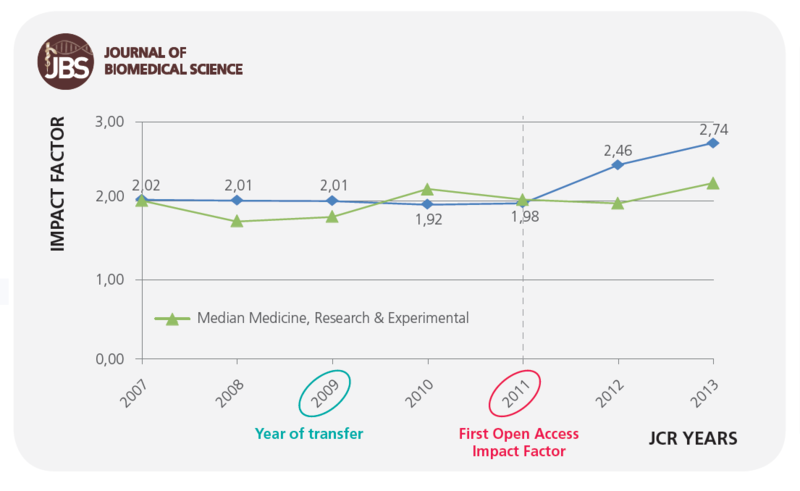 Both journals, however, have in common that in their respective first year as open access publications they accepted about 50% more papers compared to their last pre-transfer year. There is, to state this clearly, nothing wrong with this. On the contrary, there are strong scientific – or science benefitting – reasons for editors to adopt a more inclusive approach for their well established journals after a conversion to an open access, online-only environment. The point here is only to provide data and evidence to allow editors to make informed strategic decisions about the course of the journals they are in charge of: how to steer these publications when a balance between qualitative and quantitative growth has to be struck. The key word is balance as over time there is nothing mutually exclusive about the “growth paths”. The data for Journal of Biomedical Science, which this year received its third “open access Impact Factor”, by now provides further underpinning for the emerging insights into the interplay of post-conversion article numbers/selectivity and benefits in terms of rising Impact Factors. Last year we already pointed to the journal’s “delayed” Impact Factor increase. Following its transfer, the journal accepted a significantly higher number of papers per year, presumably becoming more inclusive, although the share of uncited papers actually went down. As a result the Impact Factor trend flatlined (an illustrative variation on the theme of “quantitative” vs “qualitative growth”) for a number of consecutive years. However, it began to rise when the editorial strategy changed and the number of accepted articles came down. Article numbers remain about 25% above pre-transfer levels but the Impact Factor trend is now moving along an upward trajectory. Generally, even though for now the sample size still remains relatively small, the evidence base continues to grow and can already serve as a useful guide for editors and society officers in charge of established journals for which open access may be an option to take the journal forward.